“Cycling for Libraries” Documentary première! To be honest I miss my bike, it was really weird not to cycle but have a walk through Berlin. I even glanced back at bikes who approached me during my walk. It is an indescribable sound – the sound of pedalling, rotation of wheels and squeaking brakes. But on the other hand, I feel I have finally completed the cycling stage from Copenhagen to Berlin. And I have gained a lot during the unconference of Cycling for Libraries. Look at the statistics of Cycling for Libraries videos – it is quite amazing! Now I’m really sleepy, I was sleeping all my way in a bus to/from the airport and also during my flight. Such a silence and finally I’m listening to my favourite YouTube playlist. And my Apollo Fever bicycle is waiting for the next ride. I wonder, is it really getting back in the old tracks? I’m sure only about one thing – I’m happy, smiling and beaming a lot. Would like to keep this feeling for a longer time. P.S. If you meet my Bellevue bicycle somewhere in Germany, say hello to him! P.S.S. Did you know that there is a Bellevue S-Bahn station in Berlin? I wonder how come..
With every day I start to like Berlin even more. It is amazing how easy it is cycle from one part of the city to another. The most important thing is not to cycle outside the map and the second advise would be to follow S-and-U-Bahn signs. So if you want to get somewhere just check which S-or-U-Bahn station you need. 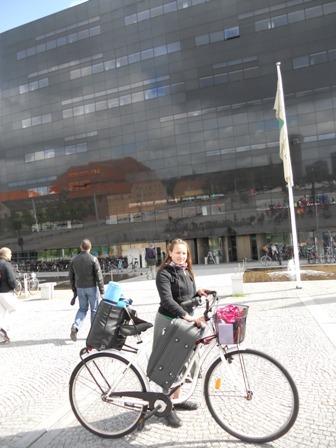 It is really sad I need to part from my legendary Bellevue which took me from Copenhagen to Berlin in 9 amazing days. Right now I’m packing my bag and afterwards I need to solve the bike-selling-issue. I would love to give it (bike of the day!) to a library related person who would appreciate its value! Two possibilities are on my mind: to sell it at a bike shop or leave it in a safe place for my next visit to Berlin.